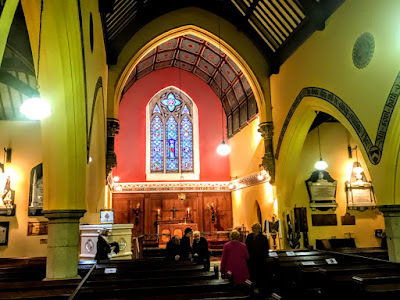 I was in Saint Brigid’s Church, Castleknock, on Saturday afternoon [26 January 2019] for the funeral of my friend and colleague, the Revd Robert Lawson, who died earlier last week. Robert and I were commissioned as diocesan readers on the same day 25 years ago in Christ Church Cathedral, Dublin, by Archbishop Donald Caird, in 1994. Later he was my student prior to his ordination in 2009, and more recently we were priest colleagues in Christ Church Cathedral. 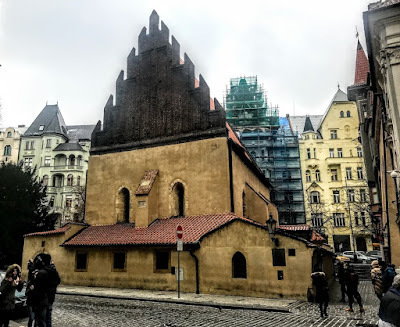 It was humbling when someone pointed out that his last posting on Facebook was a reposting of one of blog postings on the labyrinth in Christ Church Cathedral. Many years ago, he had brought me to Castleknock one Sunday morning to preach in Saint Brigid’s when the rector was Canon Paul Colton (1990-1999). Today, Bishop Paul Colton is the Bishop of Cork, Cloyne and Ross. They had remained good friends in the intervening years, and Bishop Paul was the preacher at Robert’s funeral, in that same pulpit, on Saturday afternoon. The church stands on the site of an abbey of the Augustinian Canons Regular, who built a church here around 1220. Soon after, the church a prebendal church attached to Saint Patrick’s Cathedral, Dublin, in 1227. Two of the early Prebendaries of Castleknock in the 14th century were John de Tamworth, who was also a canon of Wolverhampton, a royal peculiar, in 1364, and his successor, William de Tamworth. Other clergy associated with the parish include Richard Bancroft, who later became Bishop of London (1597) and Archbishop of Canterbury (1604). 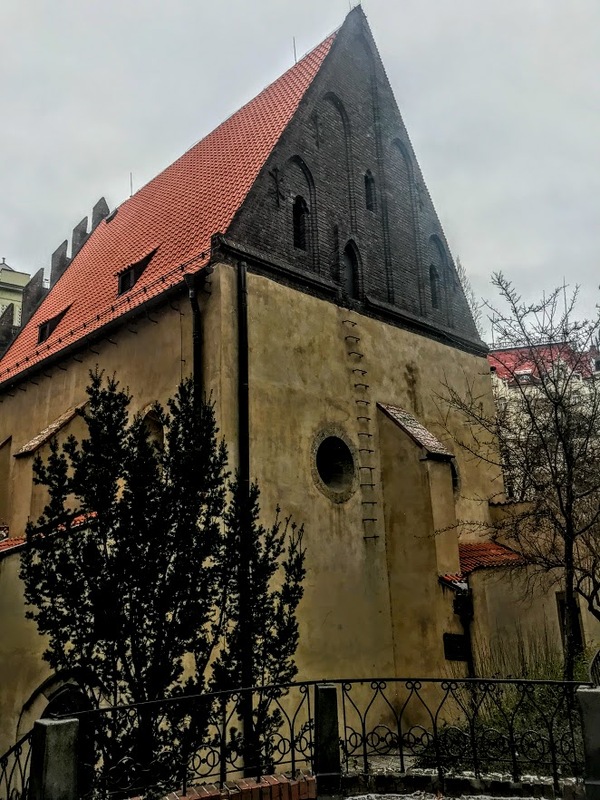 A church was built in 1609 on the site of an Augustinian church of the Canons Regular. At the time the Archbishop of Dublin, Thomas Jones, was also Prebendary of Castleknock, holding both posts at the same time (1614-1619). 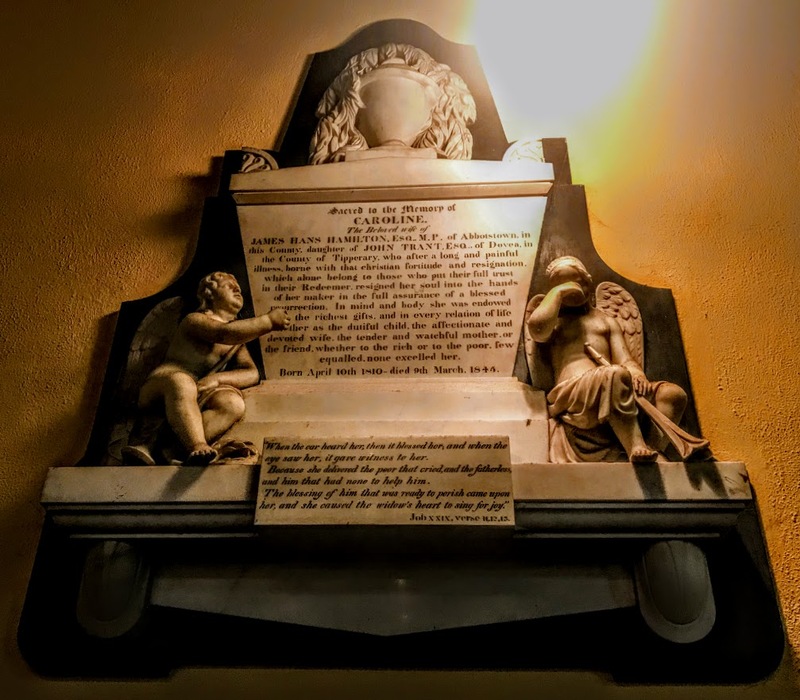 A similar situation occurred with Archbishop Lancelot Bulkeley (1620-1650), perhaps giving the Archbishops of Dublin a certain proprietorial interest in Castleknock. Saint Brigid’s Church was rebuilt in 1806-1810, with by a loan of £1000 from the former Board of First Fruits and large subscriptions. The church has a three-stage tower at the west gable. There are granite rubble walls with an ashlar granite plinth course, quoining, gable copings and three courses at the projecting nave elevation facing the street, and a blank granite panel on the tower. The flanking side aisles, added around 1860, have three-bay side elevations with gabled terminating bays at the east forming side transepts. The church has a double pitched slate roof flanked by subsidiary double pitched slate transept roofs, all with clay ridge tiles, and cast-iron rainwater goods. The church has pointed arch openings with carved granite hood mouldings, irregular quoining, cills and geometric Gothic tracery. Each opening has figurative or lattice leaded stained glass. 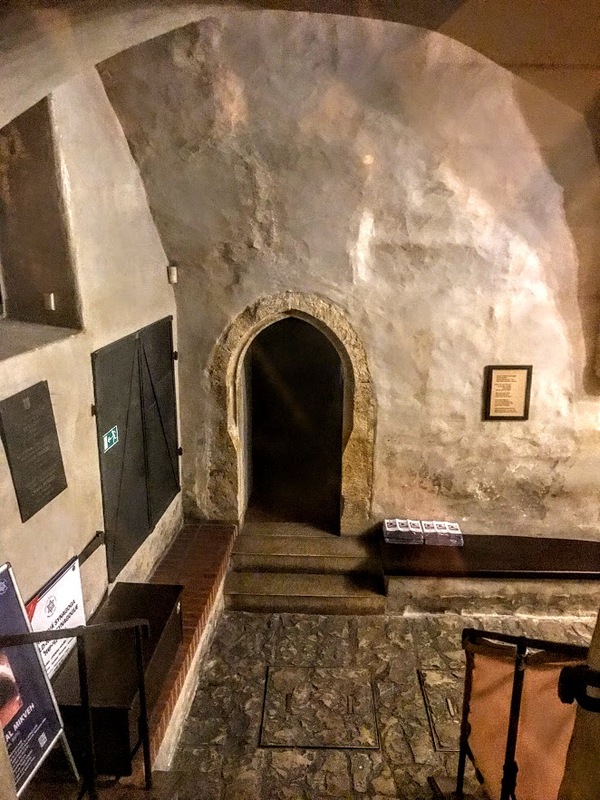 There are three pointed arch door openings, two to the street front and one at the tower with carved granite hood moulding. There are stepped soffit and reveals, and granite steps flanked by engaged stepped granite piers with triangular coping and recessed panel. The surrounding timber plank doors have massive wrought iron hinges and furniture. There are late 19th century timber-panelled, double-leaf doors with central octagonal panels and there is a Gothic panelled tympanum to tower opening. Welland and Gillespie designed the enlargement of the church in 1862-1864 to form rectangular church out of existing cruciform one. 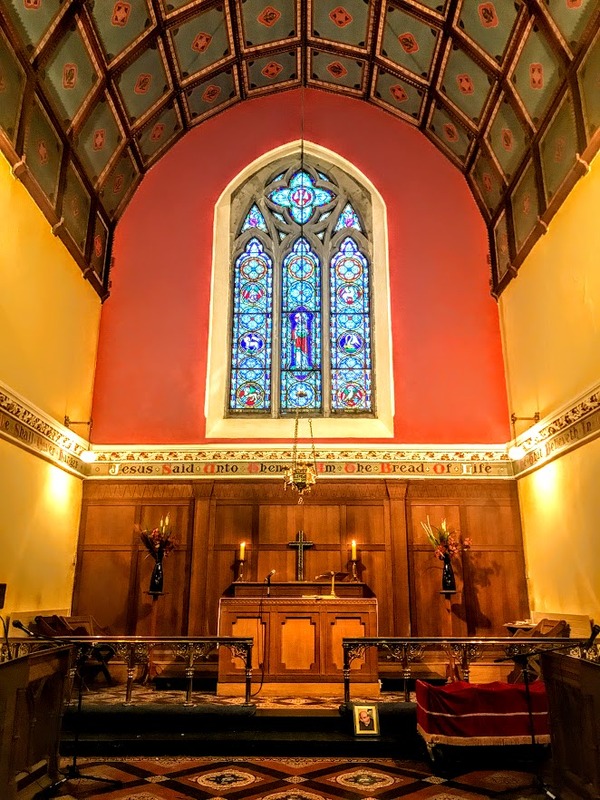 The chancel was being completed under the direction of the church architect Sir Thomas Drew (1838-1910), who also designed the Graduates’ Memorial Building in Trinity College Dublin, Rathmines Town Hall and Saint Anne’s Cathedral, Belfast. The contractors were the builders Thomas Hall and Sons. Drew also designed the organ gallery in 1870 for a new organ by Forster and Co of Hull. This was placed in the gallery in October 1870. The East Window, dating from the 1850s, is the work of the English stained glass-artist William Wailes (1808-1881), who supplied many stained-glass windows for churches in Ireland and England. Wailes ran one of the largest and most prolific stained-glass workshops in Victorian England. He had studied with Mayer of Munich and later worked closely with AWN Pugin. His famous works include the windows of Gloucester Cathedral, the East Window in Saint Editha’s Church, Tamworth, the Transfiguration East Window in Saint Saviour’s Dominican Church in Limerick, and many of the windows in Saint Mary’s Church, Killarney, Co Kerry. 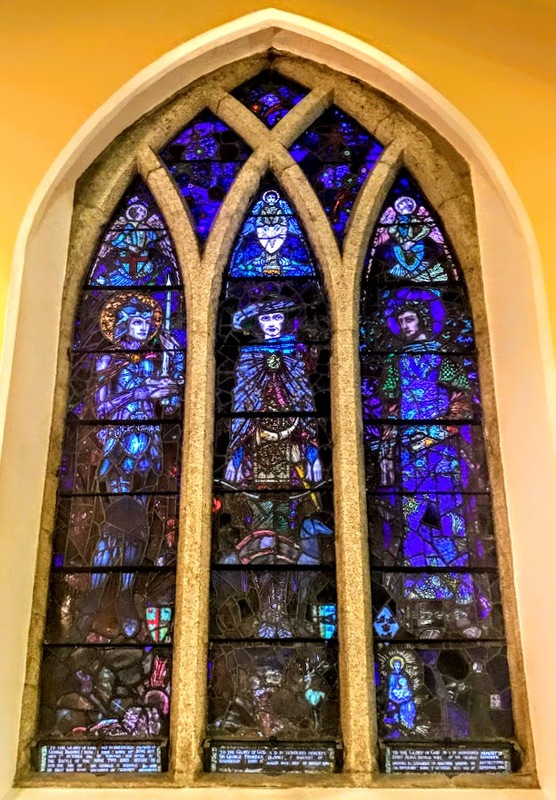 A three-light stained-glass window (1928) in the south aisle depicting Saint Hubert, flanked by Saint George and Saint Luke, is the work of one of Ireland’s finest stained-glass artists, Harry Clarke. 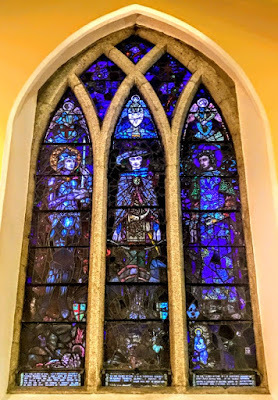 The window commemorates Sir George Frederick Brooke (1849-1926) of Summerton, Castleknock, High Sheriff of Co Wexford (1882) and Co Dublin (1898), and his family, including his second wife, Alma (Barton), and his son, Lieutenant George Brooke (1877-1914) of the Irish Guards, who was killed in World War I. A stained-glass window placed in the tower in 1864 commemorates James Hans Hamilton (1810-1863), MP for Co Dublin (1841-1863). 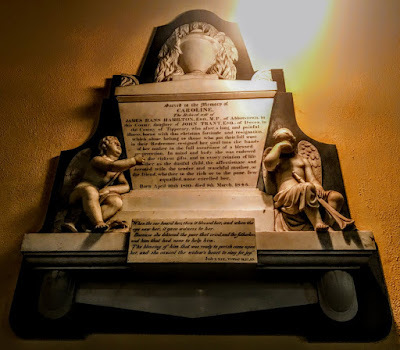 The church has a number of memorials by Alexander Ballantine to members of the Hamilton family, including James Hans Hamilton and his wife Caroline Hamilton (1810-1845), and to Canon George O’Connell (1779-1842), who succeeded his father as Vicar of Castleknock in in 1809, and remained in the parish for over 30 years. James Hans Hamilton and his wife Caroline Hamilton were the parents of Ion Hamlton, who became Lord HolmPatrick in 1897. The family took its title from Holmpatrick in Skerries, but lived at Abbotstown, near Castleknock. 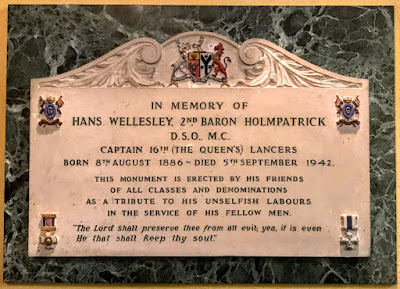 Other members of the Hamilton family commemorated in the church include Hans Wellesley Hamilton (1886-1942), 2nd Lord HolmPatrick. His grandmother was a daughter of the Duke of Wellington and a goddaughter of Queen Victoria. The present Lord HolmPatrick is a Labour politician. The HolmPatrick family also has a prominent place in the churchyard.